Is it safe to book online- how do I know that your company is legitimate? Book your Maui accommodations safely and with confidence! 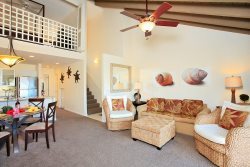 We accept all major credit cards on our secure site (no risky wiring or money orders) and travelers can book our properties with confidence knowing that we are both a Hawaii-licensed real estate brokerage company (Maui Gold Properties RB-20208) as well as a Hawaii-licensed travel agency (Maui Gold Condos LLC TAR-6626)! Is the condo I see on the Internet the one I get? If you have any questions about online reservations, please contact us, toll-free, at 1-877-874-4825. When you find the property of your choice you can either book the property online or call us at 1-877-874-4825. When making your reservation we require a 50% deposit. The remaining balance is processed 60 days prior to check-in. Check out time is 10:00 a.m for most properties. A vacation home requires more time to clean than a hotel room. CANCELLATION after confirmation of booking, which includes a Guest's decision not to stay at a rental upon arrival, results in forfeiture of any and all collected money, except the Guest's security deposit and cleaning fee (if applicable) if full payment has been made. The security deposit and pre-paid cleaning fee are not part of the deposit to hold the rental. The security deposit and pre-paid cleaning fee (if applicable) are included in the balance payment, therefore, the total deposit will be forfeited if you cancel after confirmation of booking. Collected money is non-refundable unless the rental unit becomes unfit for habitation as deemed by Owner and/or Maui Gold Condos. Under no circumstances shall Guest be able to determine if a rental unit is unfit for habitation. However, after cancellation for any reason, if a portion of the rental time is re-booked at the same rate, a pro-rata refund will be made for those dates re-booked. All refunds of rental services payments, whether complete or pro-rata, will be subject to a $200 cancellation fee. To protect against cancellations caused by certain unforeseen events, such as illness, we recommend that Guests purchase travel insurance to assure refund of deposits/payments paid. CHANGES refer to lengthening and/or shortening stay or altering dates by a few days, not moving the entire reservation to a different set of dates, which is considered a cancellation. Once booked, CHANGES may not be possible, especially shortened stays if the unit has reservations backing up to your existing reservation arrival and/or departure days as any new gaps created would be therefore be unbookable. Acceptance of any CHANGE is subject to approval by Maui Gold Condos. Any approved CHANGES made to a booking after a confirmation has been issued may be assessed a $200.00 service fee (only some properties have this change fee- please inquire in advance if you are concerned about date changes). How will I receive my confirmation and arrival instructions from MAUI GOLD CONDOS? All confirmation and arrival instructions will be sent via email. To make certain you receive these emails, please adjust your spam filter to add the domain mauigoldcondos.com to your list of accepted email addresses. You will receive a reservation confirmation including directions and arrival instructions via email within minutes of making your reservation. If you have not received these emails, please contact us at 877-874-4825. Yes, there are many shops and restaurants within 2 miles of most of our properties, and many of our properties have shops and restaurants within walking distance. Occupancy may not exceed what is posted for each property on that unit's webpage. Maximum occupancy includes any infants and/or children. Please check the specific occupancy information provided for the unit you are interested in as several units have lower maximum occupancies than what is stated below. Most of our condos have air conditioning, but many units only have air conditioning in one room (this may be the living room or bedroom)- we try to state the number and locations of air conditioners for each property under "Amenities" on the property page, so be sure to check there for specific information regarding the location and number of air conditioners for the unit(s) you are interested in. Refrigerator, stove/oven, microwave, dishwasher, blender, coffee maker, toaster, pots & pans, dishes, glasses, silverware and cooking utensils, iron and ironing board, vacuum cleaner, broom, and dust pan. *Maui Banyan studio units do not have a stove or oven, just small convenience kitchenettes with microwave. Yes, there are linens and towels provided in each condo. All bedding is provided and towels are supplied, including beach towels. Are the vacation condos cleaned daily? No, the vacation home is cleaned before your arrival and after your departure. You can request a Mid-stay Clean at an additional charge, generally $30/hour with a 4 hour minimum. A Mid-stay Clean includes: changing linens and towels, cleaning all bathrooms, kitchen area, vacuum and dusting, sweeping and mopping and refreshing your starter paper products. What is the difference between Premium, Superior and Deluxe condos? Premium vacation condos provide the ultimate in luxury, size, comfort, and location. These units feature spacious floor plans, state-of-the-art electronics like large screen TVs, the latest video game systems, computers with high speed & Wi-Fi Internet access and more, and are located in the most desirable complexes/locations (usually Wailea/Makena). Most feature granite counters, stainless steel appliances, and upgraded flooring. Superior vacation condos include highly upgraded units with stylish d�cor, including large flatscreen TVs in all rooms, and are located in very desirable complexes/locations. Deluxe vacation condos are nicely upgraded units that may feature more basic complex grounds/amenities or interior upgrades� these are usually a fantastic value, and even our lowest-rated units are very nicely upgraded, and all are in desirable buildings/locations. Many of our South Kihei properties fall into this category. All of our properties are exceptional and are amongst the nicest units being offered in their respective areas/complexes. We do NOT offer any "budget", "standard" or �island-casual� units in our inventory. What sort of extras are provided in the units?